Welcome to newcomers! We are all artful beings and websites provide a means to give or sell our work to others as well as to announce live performances. Welcome to this site–a kind of wound treatment center where we apply poetry to what ails us. But as in any treatment center, you must not expect miracle cures, invincible technology, or giants with heroic super powers. Instead, you will find palliative care, attention to each other and the world we inseparably inhabit, and compassion. First we set the wound by learning to shift frames of reference. 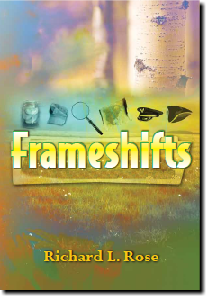 Frameshifts was a practice before it became a book. It is a matter of displacement over change of scale, not over time. This displacement is what one feels when creatively engaged on work worthy of sustained attention. It is a way of getting in stride with reality. I still rehearse this practice to find the realms and roles that give me the best take on reality. On the site, I share my work, comment on the work of others, and converse with you, if you care to reply. We work on ourselves first. Poetry, stories, pictures, music and other arts ensue. The work on ourselves is the continuing center of the conversation. What are you doing to turn continually to the center of your existence? Please sign up on this site for conversation and notices of new blogs. Here find my responses to living. So much of what matters is already given before we appear on Earth–our habitat, our people, our culture. As Kurt Vonnegut said, we just got here. We come into being without any planning, control, or programming on our part. Our lives unfold in response to the given. This newsletter will provide such responses as: links, essays, abstracts, stories, poems, book reviews, quotations, videos and music about health, humanity, the natural world, curiosity, and imagination. Like the Salvage Yard built by Avery Crawley in my book, FRAMESHIFTS, these responses make a provisional stay against waste and loss.You are invited to click on previous blog comments, Notes about Frameshifts and other writings, notices of previous or coming performances, and to visit links like those below. Please comment and let me know if you would like to do a guest commentary. Although I have sites on Google +, Twitter, and Facebook, they are to direct to readers to this website. Here is a link to a prose poem “Palliative Care” posted on the Medium site. It is now also the last section of the book Coming Around, published in 2018 by Brandylane-Belle Isle press. The “Medium” version is in prose paragraphs; the Coming Around version is in the original stanzaic form. In a chemical analogy, I think of them as being like stereoisomers. Other comments and reviews of exhibitions, movies, and books are on other parts of the site. BIO: Richard L. Rose has retired from several careers, including teaching, medical laboratory work, environmental education and research, math and science supervision, and teaching science and science teaching methods in public schools and universities. After growing up “on the road” with a military family, described in the memoir Marking Time, he settled in Northern Virginia with his wife to raise two sons and follow his vocation of teaching and avocations of writing and musical composition. Since retiring, he has produced several chamber operas, Annunciations, The Books of Daniel, Amber, The People’s Voice, two children’s books, Shura and The Queen and the Crocodile, and several books of poetry. Following his wife’s death and beginning a second marriage, he composed La Rinuncia and a novel, FRAMESHIFTS, published in 2011. All but the last of the operas were benefit concerts for groups like Amnesty, Habitat, and local charities. Another musical work, The Fisher of the James, focused on environmental concerns, and a set of stories, Hidden Moves and Hidden Faces, come from living in Richmond. The book and other projects are described on his website (marginalnotesinwordsandmusic.org) and blog http://www.frameshifts.com. In his spare time, he collects rejection slips. Recurrent themes are the transience of our lives and habitat and an insistence that we find effective ways to attend to this fact. By producing benefit concerts, reducing royalties, and recommending nonprofit organizations worthy of their attention, he invites readers to make their own creative responses. Perhaps readers of FRAMESHIFTS will be inspired to imagine and accomplish something positive for their communities. In writing, however, his intention is simply to tell a good story with interesting characters in surprising situations. Two productions, In Sweet Surrender (2015) and Strike the Rock (2018), by Capital Opera Richmond, were concerts of selected combinations of the above works. Church works, including collaboration on a hymnal with Christopher Webber, are not included. “To a Self-Made Man,” in River City Poets Anthology, 2018. Verse letter “To Edward Hirsch” in response to Hirsch’s interview by Judith Harris in the Oct/Nov 2012 issue of Writer’s Chronicle. (https://www.awpwriter.org/magazine_media/writers_chronicle_issues/octobernovember_2012) The letter was published in a subsequent edition. Two Children’s books, The Queen and the Crocodile (2008) and Shura (2008), graphics and production by Sushmita Mazumbar of Studio Pause (http://studiopause.com/ ) in Arlington, VA. Copies of these books are available from Studio Pause and may be viewed in Special Collections at the Main Library in Richmond, VA.
“Genetic Variation in the Oyster, Crassostrea virginica (Gmelin), in Relation to Environmental Variation,” in Estuaries, v. 7, n.2, p 128-132, June 1984. “The Perilous Per,” in The Science Teacher, v.58, n.6, p 76-77, September 1991. “Pick a Penny” (with William L. Rose), in Science Scope, v.16, n.3, p 41, November 1992. “Improving Remedial Students’ Approaches to Proportional Thinking in Science” 1987 Doctoral Dissertation in the library of George Mason University in Fairfax, VA. Almost all the blogs contain poems as well as comments. https://frameshifts.com/2012/01/ The first blog on Frameshifts. Information about current performances and readings, https://frameshifts.com/coming-performances-amber-and-monte-pinky/ , and past productions, https://frameshifts.com/performance-schedule/. Links and additional book reviews, https://frameshifts.com/connections/ .